Ink, watercolor, and metallic pigment, 2015. She is a lantern in the forests of the night; she is a jeweled lamp, lit by birds of flame. Her robes are sunset and twilight; her robes are woven magic, and her hands are drunk on the blood of the dusk. She is splendor. She is death radiant. She is the glorious end. 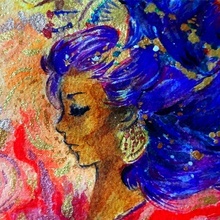 Filipina visual artist and calligrapher working in traditional media: ink, watercolor, gouache. My art tells the stories of women, monsters, cities, fire.